Exhibit of Goryeo dynasty Korean Buddhist Paintings – Wake Up and Laugh! An exhibit of Goryeo dynasty (918-1392) Buddhist paintings is being held at the National Museum of Korea until November 21. There are only 160 of these paintings in the world, and 61 are displayed here. Chances to see these paintings are very rare, so don’t miss this exhibition if you’re interested. These tend to be wall-size paintings, and are quite old, so the photos here really don’t do them justice. Here’s the info from the museum’s webpage:http://www.museum.go.kr/eng/Special.do?cmd=1001&gc_no=580 There’s a small entrance fee, and the museum is closed Mondays. This exhibition brings together Goryeo Buddhist paintings from all over the world in the largest exhibition of these works in history. Goryeo Buddhist paintings are widely seen as some of the most beautiful religious art in the world. Their delicate and graceful forms indicative of the high aesthetic standards of the Goryeo people, their brilliant primary colors and resplendent gold pigment, and their beautiful yet powerful flowing lines combined to create an unparalleled world of beauty in the East Asia of the day. Currently, there are known to be approximately 160 Goryeo Buddhist paintings around the world. Of these, a total of 61 are to be included in this exhibition, including Hyeheo’s Water-Moon Avalokiteshvara, currently housed at Japan’s Senso-ji temple. These 61 paintings include 27 from Japanese collections, ten from U.S. collections, five from European collections, and nineteen from Korean collections. In addition, the exhibition will feature 20 Buddhist paintings from China’s Southern Song and Yuan Dynasties and Japan’s Kamakura period, allowing visitors to examine trends in East Asian Buddhist painting over a similar time period. Also on display will be five Buddhist paintings from the early Joseon era, inheritors to the tradition of Goryeo Buddhist painting, along with 22 statues of the Buddha and metal crafts from the Goryeo era, for a total of 108 paintings and other artworks. 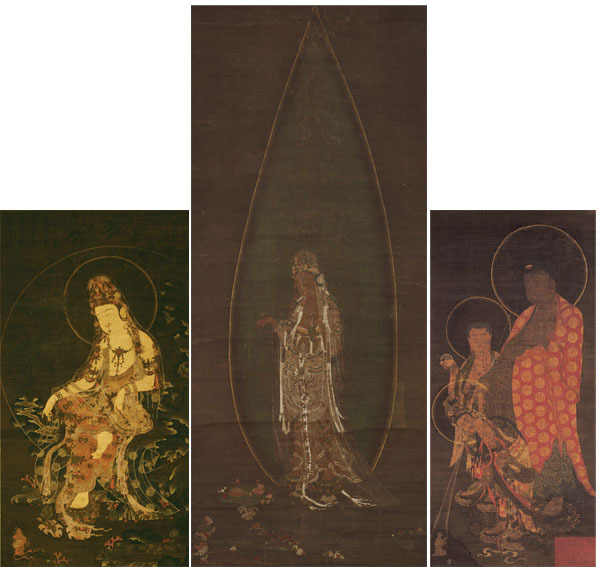 61 Goryeo Buddhist paintings including Hyeheo’s Water-Moon Avalokiteshvara (middle) will be on display. The exhibition has been organized by theme. The introductory section, “Goryeo Buddhist Paintings: The Flower of Truth,” provides information about the historical background and themes of Goryeo Buddhist paintings, helping visitors to more fully appreciate these works. The first section, “Buddha: The Enlightened One,” features those works of Goryeo Buddhist painting that focus primarily on depicting the Buddha. Many of them depict Amitabha, in what is perhaps a reflection of the flourishing of Sukhavati belief in the Goryeo era. The Amitabha from the collection of Japan’s Shobo-ji temple is an example of the “descent of Amitabha” form, showing Amitabha approaching the departed to welcome them into paradise, and evokes wonder with its vivid primary colors and beautiful, intricate patterns, which survive intact to this day. The second section, “Bodhisattva: Savior of Sentient Beings,” features paintings of Avalokiteshvara and Kshitigarbha, familiar figures to adherents of Buddhism. The Water-Moon Avalokiteshvara from the collection of Japan’s Danzan-jinja shrine depicts a solemn and graceful Avalokiteshvara sitting on a rocky outcrop of Mount Potalaka and greeting Prince Sudhana, who has come seeking the wisdom of the Buddha. The third section, “Arhat: Paragon of Spiritual Practitioners,” includes the Five Hundred Arhats series painted in the years 1235 and 1236 during the Goryeo era. Painted as a plea for peace in the kingdom and the well-being of the royal family, this series contains around 14 known works, seven of which are housed at the National Museum of Korea. All seven of these are to be shown at the exhibition, along with three others on loan from the U.S. and Japan. Through these ten works, viewers will be able to see the majority of extant paintings from this series. The fourth section, “Buddhas and Bodhisattvas in Neighboring Countries,” features works of Chinese and Japanese Buddhist painting that were painted during the same time period as the Goryeo Buddhist works, affording visitors a broader perspective in appreciating the era’s East Asian Buddhist culture and painting. In particular, it features three Western Xia Buddhist paintings from the 12th and 13th centuries, excavated at Khara-Khoto in 1909 and currently housed at the State Hermitage Museum in Russia. These works are well known among academics to have a strong affinity with Buddhist painting, but this marks the first time the actual works have been shown in Korea. The final section, “Succession of the Tradition,” examines the ways in which the tradition of Buddhist painting was carried on in subsequent eras, with a primary focus on Buddhist paintings commissioned by the royal house during the early Joseon era. The works on display include two pieces from the Medicine Buddha Triad, part of a commission of 400 Buddhist paintings by Queen Munjeong to honor the rebuilding of Hoeam Temple in 1565. * Paintings are alternated during the exhibition period, so exhibition times for the different works may vary.